Due to complex survey rules it is difficult to make a centre console legally acceptable for commercial work. 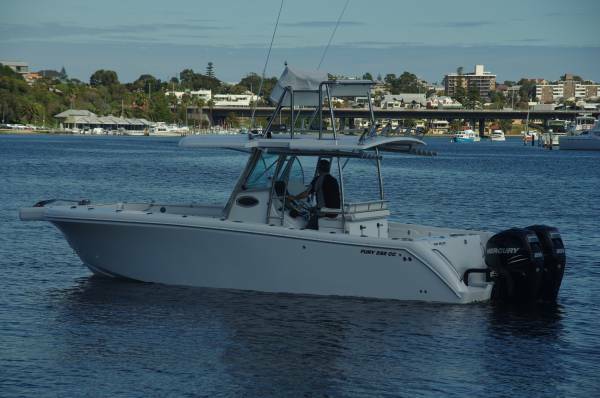 When On Strike Charters of Exmouth wanted such a boat for their big-game tag and release operation, they found that the Fury 282 was the only boat that fitted their bill. Not that they found it a painful buying decision: the Fury has long been an admired offshore fishing boat among leisure fishermen, and custom work during the building fitted it exactly for the Exmouth task. Key modifications were to make it easy and spacious for half a dozen anglers to line a rail. 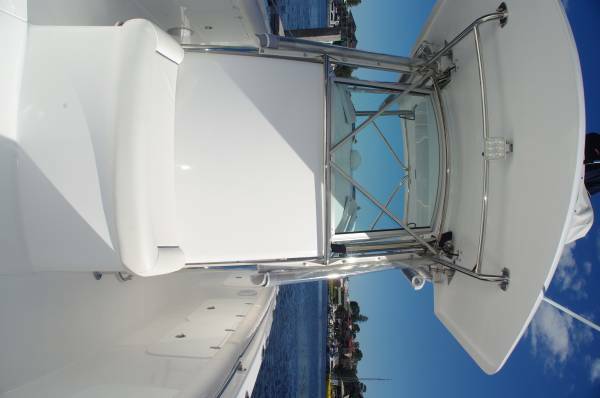 The bow rail has disappeared, and the hardtop supports that in other Furys are carried on the coamings are now mounted on the console: not a single obstacle between angler and fish. But the most visible custom feature is the tuna tower, a first for Fury. The aim of a tower of course is to push the horizon further away and to provide a downward slant to closer range vision. The sensation from the Fury’s tower is of being even higher than you actually are, brought on by the sparseness of the structure up there. Added top weight is never a bonus, so there are just a basic backrest and a console the size of a medium-weight keyboard. 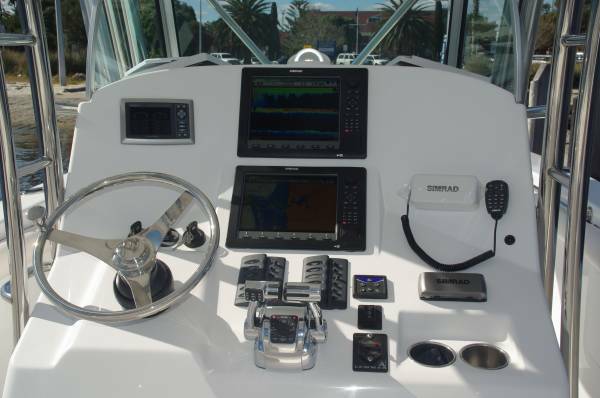 This carries steering and throttle controls, and a share of the boat’s $30,000-worth of Simrad electronics. The broadband sounder would set any angler to salivating. As well as the other enhancements broadband provides it offers 3D imaging, has a built-in auto pilot in the head unit, and the head unit also drives the stereo and accommodates iPods. It searches for fish as well. The lack of a seat upstairs is no handicap because travelling is done at the very comfortable lower station; technically a centre console, but practically as sheltered as a wheelhouse even without the enveloping curtains and clears in place. The hardtop extends out to the sides and the curtains lower from there to the rails, providing a large enclosed space – that is seldom called for at Exmouth. 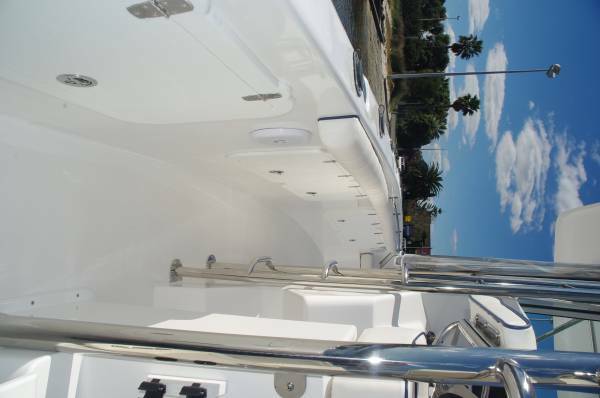 The console’s size allows it to house an uncramped toilet; ahead of the toilet, and below the foredeck, is a double bed. Standard fitting on leisure Furys, the owners could see its occasional usefulness and retained it. The difficulty of fitting enough seats into a centre console deters their use as charter boats, but this one is well set up. One or two passengers can sit alongside the driver in addition to those on the built-in seats ahead of the console and aft of the collision bulkhead, and on the folding lounge aft of the driving position. 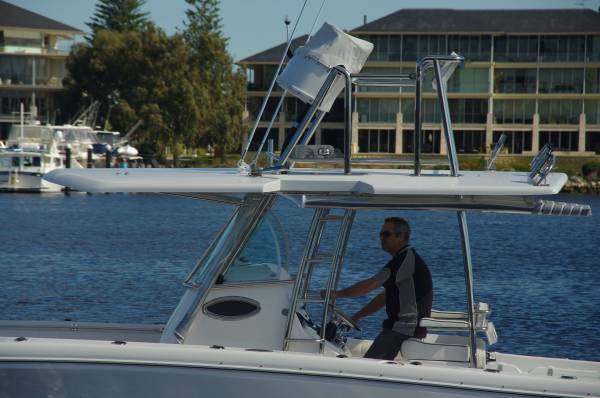 These passengers are exceptionally well provided with stowage space, something often lacking on charter boats. The bulwarks alone house enough lockers for them to have two each. 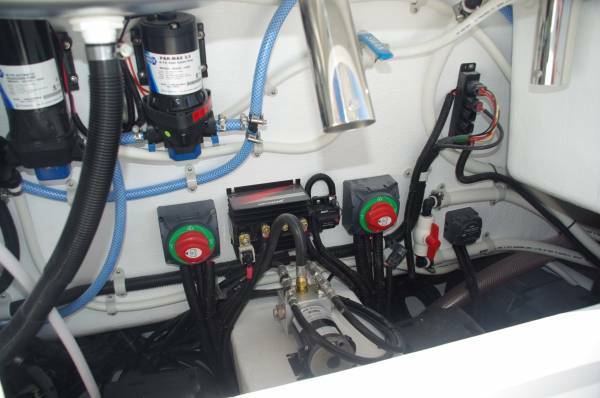 Stowage for the all-important cold drinks is in a 100L icebox below the driving seat, although they could also use ice slurry in the two big under deck lockers. In the more strictly fishing department, stowage is provided for no fewer than17 rods in the coamings and on the hardtop. 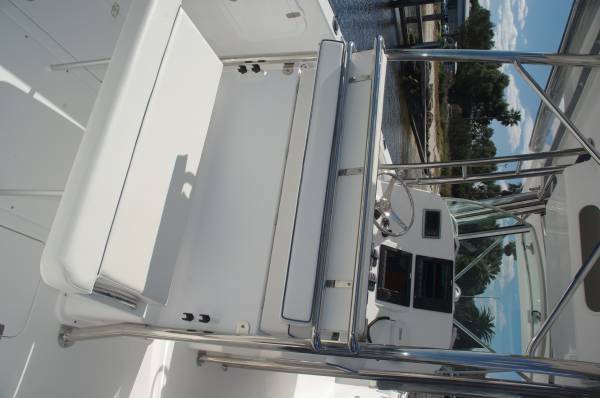 The bait station aft has a sink as well as bait tank and board, and it has the same drink holders that are strewn all over the boat. Furys have been delivered powered by outboards of most makes, singles and twins, with Mercury Verados probably the most common. 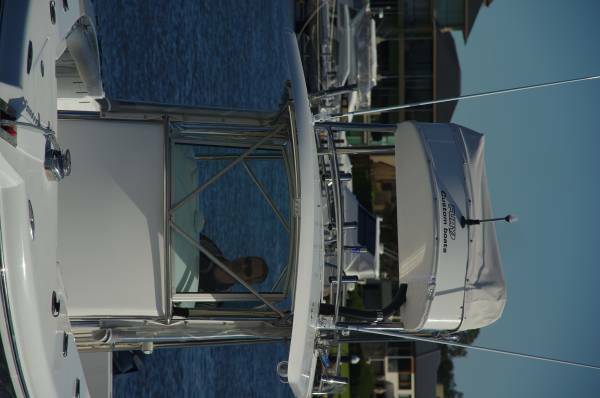 The review boat has a pair of these in 200hp form; they give a cruising speed of 30+ knots with a full passenger load. In Exmouth’s sea conditions that speed would of course be comfortable most of the time, but much the same applies further south: this is a soft-riding boat. Quiet too. The foam sandwich construction has sound insulating properties as well as great stiffness, which also suppresses noise. 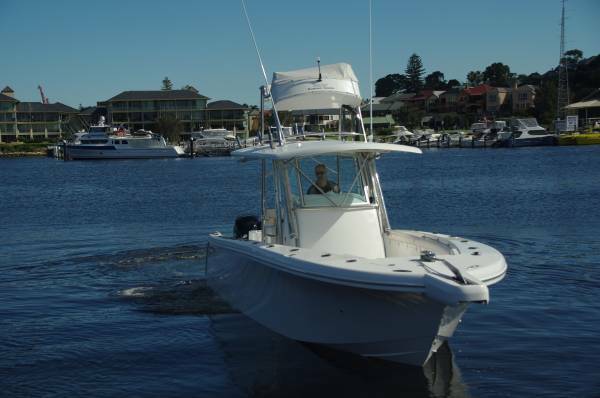 A charter boat that would be on most wish lists for a personal fishing boat. Get one and you will be surprised at how many friends you have.